The first-ever Sri Lankan woman to qualify abroad as a Chartered Textile Technologist and to go on to become the first Sri Lankan woman Fellow of The Textile Institute UK is to be felicitated by the University of Moratuwa – Department of Integrated Design, Faculty of Architecture for her substantial contribution towards the growth of design in Sri Lanka. The Department of Integrated Design of the University of Moratuwa is set to host a week-long celebration of product design, fashion and lifestyle design, media and communication design at the highly-anticipated ‘Sri Lanka Design Week 2018’ which opened at Zone D, Arcade Independence Square on 7 August and will continue through up to 12 August. This year’s event will conclude with an extravagant fashion show featuring work created by students of the university’s Department of Integrated Design. 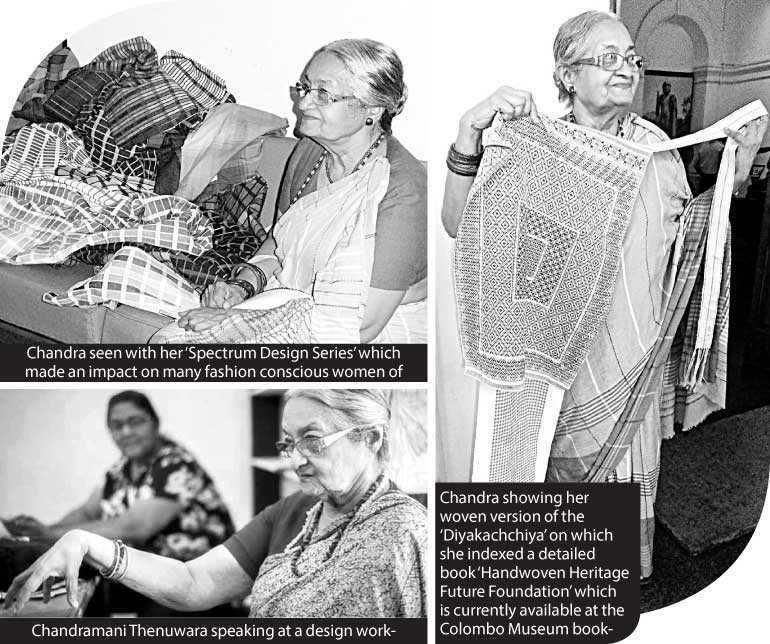 Arrangements have been made to present Textile Technologist and Designer Chandramani Thenuwara with a Lifetime Felicitation Award in recognising her unstinted contribution made towards design development in the textile sector and the field of arts and crafts in general. Throughout her career working with rural weavers and university students alike Chandra had a rare talent in combining her vast creative talent in art which she accumulated as a student of Cora Abraham with her academic education and knowledge she received to qualify as a Charted Textile Technologist in England. Upon returning home, she worked tirelessly in imparting her acquired knowledge with a large number of rural women who were making a living by working at various weaving centres situated in many parts of the country. This she did by making her services available to the Department of Small Industries as a Textile Designer where she was responsible for lifting the standards and innovation of hand-weaving design of the entire Government handloom industry, and also extending her services towards educating the new generation of textile/fashion designers. “This award is significant to me in many ways than one,” says Chandra, explaining that it was in the early eighties that she met a young designer who had arrived in the island following his graduation on the subject of fashion design from St. Martins – London. Together they develop a line of creations combining her textile designs with his creative talent of designing clothes for his own label titled ‘Cross Blood’ by Mangala Innocence and the first-ever collection to be presented at a fully-fledged fashion show titled ‘Travelogue’ and the fact that they were both qualified in their chosen subjects in the United Kingdom during two different eras too was of some remarkable significance. That designer from whom Chandramani Thenuwara will be receiving her award is none other than the person who will be gracing this event as its Chief Guest, Minister of Finance and Mass Media Mangala Samaraweera.